After the first WorkShop in Marseille we announce the second edition of the WaveFront Sensing in the VLT/ELT era. 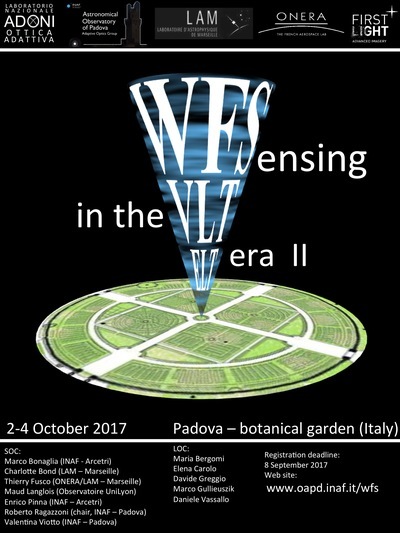 The Workshop will take place in Padova, Italy, at the local Botanical Garden, from 2 to 4 October 2017. WaveFront Sensing is at the heart, and a key component, of an Adaptive Optics system and often it dictates the ultimate capabilities of the latter, especially in the astronomical domain. The new challenges dictated by the development of some science field, like the exoplanets detection and characterization, pushed the development of these devices, along with new opportunities coming from new generation of instrumentations for 8m class telescopes and the construction of a next generation of Extremely Large Telescopes. In this scenarios new technologies, new developments, new concepts, and new ideas, circulated in the framework of WaveFront Sensing. The parameter’s space where such devices are requested to push their limits beyond the current one –and sometimes beyond what is believed to be their ultimate limits- become increasingly large and to some extent complex. Wide field, use of artificial references from large apertures, new level of accuracy in the compensated wavefront –just to mention a few examples- are just among the new kind of challenges where detector’s technology, ideas and devices are requested to compete in a race for the ultimate performance in terms of contrast, field of view, sky coverage, to name a few examples. The community, and again, especially students in the field, are kindly invited to propose your work for a talk and to attend the whole workshop.